SpaceX's Falcon Heavy launches on its first-ever flight, a Feb. 6, 2018, test mission. 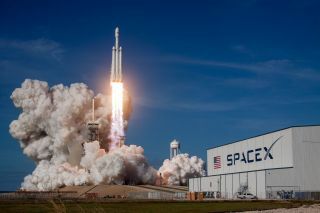 SpaceX plans to launch the first commercial mission of its Falcon Heavy megarocket early next month, according to media reports. The company is targeting April 7 for the launch of the Arabsat 6A communications satellite from historic Pad 39A at NASA's Kennedy Space Center in Florida, CNBC reported Friday (March 15), citing anonymous sources. SpaceX has not officially announced a launch target for the Falcon Heavy mission. The 13,200-lb. (6,000 kilograms) Arabsat 6A was built by Lockheed Martin and will be operated by the Saudi Arabian company Arabsat. The reusable Falcon Heavy, the most powerful rocket flying today, has one spaceflight under its belt — a test mission that lifted off on Feb. 6, 2018. The rocket launched SpaceX founder and CEO Elon Musk's red Tesla Roadster — driven by a spacesuit-clad dummy dubbed Starman — into orbit around the sun. The Falcon Heavy is based on SpaceX's two-stage Falcon 9 rocket, which has executed dozens of launches and first-stage landings over the past few years. The Heavy lashes together three Falcon 9 first stages; the Heavy's second stage, and the payload to be launched, sit atop the central first stage "core." Two of the Falcon Heavy's three first-stage boosters aced their landings during the rocket's February 2018 test flight. The central core came close, narrowly missing its target "drone ship" in the Atlantic Ocean off the Florida coast.